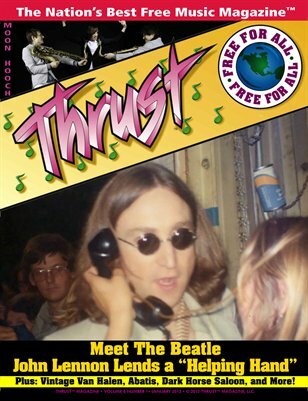 The new issue of Thrust™ Magazine is now available to be mailed to your door, featuring never-before-published photos of John Lennon from 1975, and two fans stories of how they met the famous Beatle in the WFIL charity Helping Hands marathon. That's not all. Hard rock is back (all the way to 1974—read the story to see what we mean), with new releases from Jacksonville, Florida's Dark Horse Saloon and S F, CA's Abatis. Do you dig underground music? Then check out our story on Moon Hooch from New York City, NY, and the new cave-music genre. You can also learn about All Tiny Creatures, who are starting to come under the magnifying glass with their new music. There's more, too. Be sure to check out Thrust™ Magazine's look back at the David Lee Roth era of Van Halen. It's all in the new issue of Thrust™ Magazine. Have it delivered to your door.